THE IRISH FESTIVAL was officially launched on Saturday night., though disappointingly, Irish Prime Minister Bertie Ahern was unable to come over from Dublin to launch the festivities. Michael Gassey from the Irish Embassy, London, and many local personalities with Irish connections, were in attendance at the Town Hall, including Cllr Pat Karney - he's chairman of the Irish Festival steering committee - also Midland Hotel boss Shaun McCarthy and Northwest Tonight presenter Gordon Burns. This years' Irish Festival looks like being bigger and better than ever before. 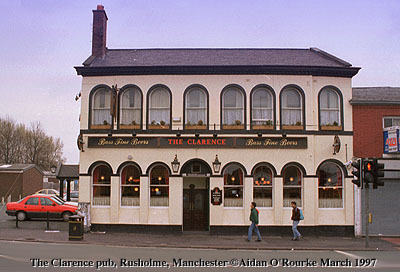 The climax is next Sunday's St Patrick's Day Parade, departing 12.00 from the Irish Centre on Queens Rd Cheetham Hill and proceeding via Cheetham Hill Rd, Deansgate and St Ann's Square to the Town Hall, where there'll be Irish food and lots of Guinness on tap. I'll be there! 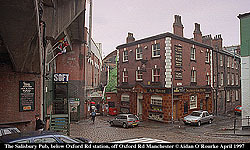 A large number of people from the Manchester area have Irish connections, including myself. My parents came here from Abbeyfeale, County Limerick in the fifties - I was born here in 1958. 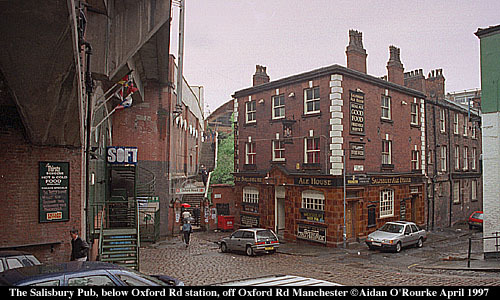 The topic of Irish communities in Manchester is a fascinating one - yesterday, with my mum, I went on a walking tour of the area known as "Little Ireland" - roughly the area west of Oxford St and south of Whitworth St, bounded to the south by the River Medlock. When we arrived, more than 30 people were waiting near the Salisbury pub, right. Manchester University geography specialist Mervyn Busteed's talk, illustrated by copies of old Ordnance Survey maps, was fascinating. More info on other events in the Irish festival in the official guide (order a free copy on 0161 234 1943), and its website version or tune in to the radio station at 87.7 fm. A HUGE NEW SAINSBURY'S has opened in Fallowfield, on the site of the old Fallowfield station, between Ladybarn Rd and Egerton Rd. The state of the art supermarket was full of shoppers when we went there on Saturday afternoon, with a jazz band, smiling assistants and shelves stacked full with the staggering range of groceries we expect nowadays. At the front they've squeezed the new supermarket to the side of and behind the old station building, which closed in the 60's. 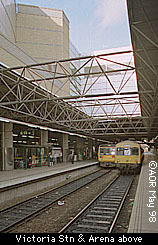 At the rear, the building has lifts and an airport-style moving walkway to transport people between the main hall and the car park below. Other major supermarkets in the area are Tesco's at Parrs Wood, and Asda in Longsight and Hulme. This week's main photo is taken from the front of the car park at the Hulme Asda store on Greenheys St West - soon this view will be obscured by new buildings. 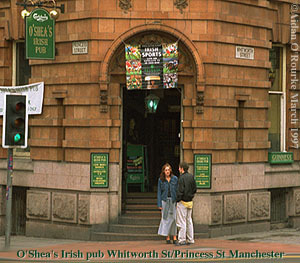 And here's a small selection of some of Manchester's Irish or should I say "Irish" pubs -how many do you recognise? A MOTHER saved her 7 children from fire by dropping them from a window into the arms of rescuers. Joanne Winterbottom was praised by firefighters for her prudent actions. The fire started at the family's home on Colgrove Avenue Moston early today. This is a happy escape, especially as seven members of one family died in a horrific house fire in Chingford, north west London late last week. Even more horrific is that it was started deliberately. AMERICAN TV PROGRAMME 60 MINUTES, the current edition of which makes new claims about the Louise Woodward case, was shown on Sky News this evening at 6.30pm. Two specialists said hey thought baby Matthew Eappen was strangled up to 48 hours before his death, and that Louise Woodward's conviction was unsafe. Her defense lawyers say they are now going to re-open the case. AFTER TELLING YOU last week that race relations were better here than elsewhere, I was dismayed to read Wednesday's MEN front page, which told of increasing racially motivated attacks in Greater Manchester. Home Office minister Paul Boateng revealed that the number of such incidents in the 10 Greater Manchester districts rose from 595 to 624 last year. 9 years ago a bunch of Asian youths tried to attack me at 3.55 am on on Wilmslow Rd in front of the "Toast Rack" building on my way home from a party in Didsbury - they tried to grab me but I broke free and sprinted to the call box at Dickenson Rd. Soon after, one of them opened the door, as I was dialling 999 slammed his hand on the phone and said: "We got the wrong bloke". I think this was more a case of mistaken identity than a racially motivated attack. I've mentioned this incident previously - apologies if you've heard it before. HOSPITALS IN THE NORTH WEST are to receive £156m, Health Secretary Frank Dobson announced on Wednesday. And at Manchester's Christie Hospital, a new scanner has been installed, which will help reduce waiting times. It was paid for from a fund set up by journalist Pat Seed, ex-Christies patient who campaigned to raise money for the hospital until her death in 1984. MANCHESTER CROWN COURT has been hearing evidence in the trial of Darren Vickers, accused of murdering five year old "scamp" James Lavis. The boy's remains were discovered in Reddish Vale five months after he disappeared on May Bank Holiday 1997. Jamie's mother, Karen Spooner, told the court today how Darren Vickers moved into her home and joined in the search. She denied they had had an affair. Vickers pleads not guilty to abducting and murdering the child. Is this another one of those bizarre cases where the murderer, in the full glare of the media, feigns innocence, or is Darren Vickers actually not guilty of the charges? DIVER ROBERT GLAZZARD was found to have suffered horrific throat injuries before his death. The expat from Rochdale went missing off the coast of Dubai on 11 January, and his body was later recovered from the Gulf, along with the remains of his New Zealand colleague Aaron Hopa, who was also found to have similar injuries. The authorities in Dubai failed to mention these wounds before handing over the bodies for repatriation. The Coroner has now asked Greater Manchester Police to pursue the matter with the Dubai police. I've spent quite a lot of time in the United Arab Emirates. A WALK IN THE PEAK DISTRICT can kill you, especially in the current weather conditions. Tim Brett 44 and his ten year old son Thomas left their home in Sheffield on Saturday, drove into the Peak District, parked in a lay-by on the Snake Pass and went for a walk. Soon, the weather deteriorated: "There was a total and absolute white-out" said Tim this evening on Granada Tonight. They were rescued by helicopter after spending 20 hours in the open. 120 people took part in the search, one of the largest in recent years. 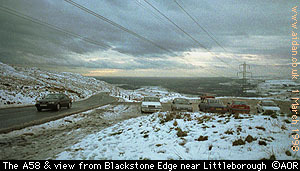 This picture is another from the archives, taken on Blackstone Edge, above Littleborough, about 10 yards from the car park! THE OPENING OF THE SECOND RUNWAY will almost certainly be delayed. The reason: wet weather, which has turned the R2 site into acres and acres of mud. And other airport news: ex-hippy Chris Maile is to go before the House of Lords to appeal against an order to evict environmental protesters from Arthur's Wood, part of Styal Country Park, next to the Second Runway. From the new tax year (6 April) the Airport will be freed from local authority borrowing restraints, allowing bosses to do things on a more commercial basis, and a new twice-weekly air service between Manchester and Kuala Lumpur begins on March 30th. It's operated by Malaysia Airlines and has been promoted in an extensive billboard and newspaper ad campaign. PERFORMANCES THIS WEEK have included Jesus Christ Superstar at the Opera House, the RNCM Wind Orchestra at the Royal Northern College of Music, Nina Simone, Roh Orchestra, Camerata/Kraemer at the Bridgewater Hall, 3 Colours Red at Manchester University, "Wait until Dark" at the Oldham Coliseum and Underworld at the Apollo. On Tuesday of last week, Robbie Williams sang and joked about in front of 16,000 at the MEN arena, and warned his ex-manager Nigel Martin Smith: "I am your worst nightmare". Robbie's anthemic hit "Angels" was used at the end of the second episode of City Central, screened on BBC 1 on Saturday night. "Lord of the Dance" is on at the MEN Arena on the 23rd, 24th and 25th of March. Tickets are £26. is on Bruce Springsteen is appearing at the MEN Arena on the 1st of May. COUNCILLOR RICHARD LEESE has given details of cash reserves which may act as a "safety net" for the 2002 Commonwealth Games. He said the Council has had a surplus of about £1m in each of the past two years, and that this money would be put into a reserve fund. "We are not going to end up closing libraries to fund the Commonwealth Games. We are not going to take a risk with peoples' money" he said. More info on the Games at the official commonwealth Games website: www.commonwealthgames2002.org.uk produced by my colleagues at Manchester Online. And today was Commonwealth Day (though not many people know it) - to celebrate, bands entertained the public the Airport and other places, including Victoria Station, where Parrs Wood School brass band played for commuters and BBC1's Northwest Tonight. Manchester City Council Chief Executive Howard Bernstein was interviewed, and said that tenders are out for the new 2002 stadium, and that construction should begin in the summer. The new Commonwealth Games pool is already under construction, he added. Picture coming soon. BROOKLYN BECKHAM was born to David and Victoria "Posh Spice" at 7.28pm on Thursday evening at Portland Hospital in Central London. Neighbours in Alderley Edge put up cards and pictures on the streets to celebrate. The MEN ran a reader poll asking "Should people give their children strange names?" The response was 88% "No, they shouldn't". 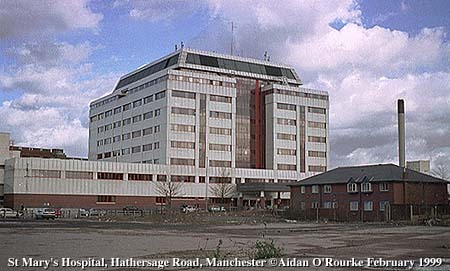 So when the time comes, I think we'll give "Ordsall O'Rourke" a miss. RED NOSE DAY is on Friday March 12th, and more and more of the newer, softer and squeakier variety of red nose have been seen on celebrity noses on TV and around the city. The three domes of the Trafford Centre will be turned into red noses using vinyl sheets and spotlights. Many fund-raising events will happening both locally and nationwide. But pupils at St Bedes College, regarded as Manchester's top independent Roman Catholic college, won't be taking part: Headmaster John Byrne has banned them from doing so, as some of the funds go to charities which are involved in abortion. IT'S A BRIGHT SUNNY AFTERNOON here at the Formby Space Centre, just north of Liverpool, and as the countdown nears its climax, the croaking of rare frogs at a nearby nature reserve is interrupted by the low roar of the majestic Starchaser 11 rocket, now lifting off slowly from the launch pad, with veteran rocketman Steve Bennett and his crew of 3 aboard, heading into space for a two week mission... Sounds like one of the compositions I did as a child but who knows maybe it will come true. My imagination was spurred on by news of the successful launch on Friday of Steve Bennet's latest rocket. The momentous event took place at the territorial army's rifle range at Altcar, near Southport, in the presence of the national media. The 14 foot "Tempest" rocket went half a mile into the sky before parachuting back down onto the beach. Steve is from Dukinfield and lectures at Salford University. By the way, I'm not always accurate at telling the future - in the past, I predicted dismal failure for U2's Bono and ex-Take That Robbie Williams, and once reckoned petrol cars would be extinct by 1980 - but let's hope I'm wrong this time. And maybe Steve Bennett is responsible for the return of that decidedly retro-sounding expression: "It's not rocket science" which you hear in every office and board room meeting nowadays, usually in reference to some computer problem. MARPLE'S FLIGHT OF 16 LOCKS has been drained by British Waterways engineers for repairs. They're removing the accumulated silt and rubbish, which prevents the lock gates from closing properly. They'll be open again in time for the start of the boating season on March 13th. And lottery funding is being sought by the Steam, Coal and Canal Project to create an industrial heritage park along the Bridgewater Canal between Worsley, Castlefield and Leigh. 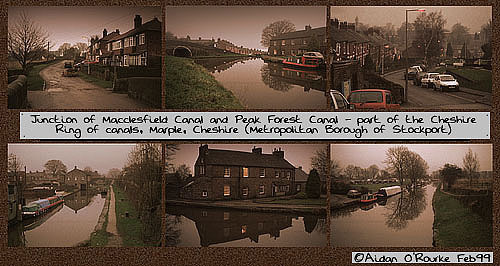 The photos above were taken about half a mile south of the Marple Locks. These snaps aren't going to win any prizes for blue skies and pin sharp saturated colours, but they attempt to capture the dull, misty, drizzly weather we've been having lately. BERYL BAINBRIDGE'S ASSERTION that Scousers should lose their distinctive accent has provoked debate here in Manchester too. Many people aren't keen on the Liverpool way of talking, with its rising intonation and gutteral sounds, but Liverpudlians on the street told local TV reporters they liked their accent (at least I think that's what they said - some of them were a bit difficult to understand!). As for the Manchester accent, well, what exactly is it? The dulcet tones of Shaun Ryder and the Gallagher brothers, perhaps, but if you go 12 miles north west to Bolton, BBC music presenter Andy Kershaw sounds completely different, and as for Joanne Whalley-Kilmer there's no trace of her Stockport origins when she's doing her American accent in Hollywood movies. Personally, I think it's a question of what's right for the occasion. A Mancunian twang is a positive asset in football or music circles, but if Shaun Ryder applied for a job as, say, English master at Eton College, he may find his accent would count against him (and a few other things too!). 53% of respondents to Thursday's MEN poll said they didn't think a regional accent is a social handicap (but 47% did). 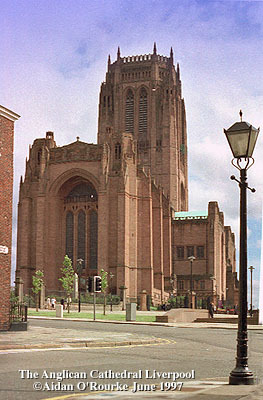 Here's a picture of the Anglican Cathedral, Liverpool. MANCHESTER UNITED celebrated a magnificent victory over Inter Milan at Old Trafford on Wednesday night, and on Thursday's MEN front page, Mick Hucknall appeared alongside Alex Ferguson, who, as previously mentioned in EWM, is celebrating his testimonial year this year. Victory eluded the Reds on Saturday, with a 0-0 result in Saturday's match against Chelsea. Other soccer results listed in today's MEN: City-0 Northampton-0; Bury-0 Crystal Palace-0; Swindon-3 Bolton-3; Huddersfield-3 Stockport County-0; Oldham-2 Bournemouth-3. Rugby League: Swinton-23 Bramley-8; Salford-12 St Helens-30; Ice Hockey: Manchester Storm-1 Steelers-3; Basketball: Manchester Giants-94 Eagles-92. SPRING HAS COME EARLY to areas north of Manchester but late to the south - gardeners at Heaton park report blooming flowers, while at Tatton, it's still winter. I've noticed daffodils on the grassy verges next to Princess Rd, and purple flowers are starting to sprout in the Peace Garden near St Peters Square. But in the Pennines, there's been heavy snow, as previously reported, and outside it's cold and damp. Granada weatherman Fred Talbot said on Granada Tonight that he doesn't know when the spring is going to come. Diane Oxberry, on BBC Northwest Tonight reported that we've had 50% of this month's rainfall already. 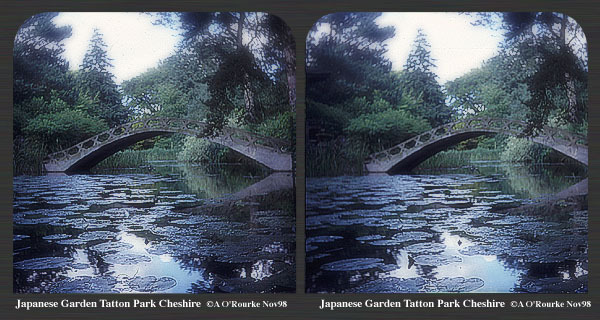 Here's a watery view of the Japanese Garden at Tatton Park, taken in stereoscopic format. Please contact if you'd like info on how to view this picture in stereo. 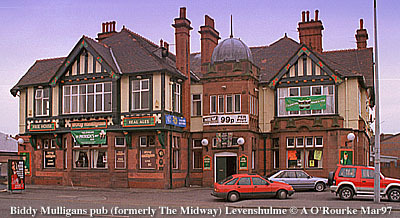 By the way Fred Talbot will be appearing in a short film being produced by Stephen Gibbons in Oldham later this month. I'll be doing the photography, and ITV's Granada Tonight will be there too. More details in next week's update. The EWM temperature is currently 38 fahrenheit, 3 celsius.